Since I was about 10 or 11, I have been known to gaze skywards after dark. My introduction, as it were, was to the figures of Cassiopeia, Orion and Ursa Major. Viewing from 56 degrees north, these were the familiar sights. Having now spent 25% of my life Down Under, I have swapped Cassiopeia for Crux, Ursa Major for Dorado, and Polaris for the LMC. I also have the Galactic Centre where I used to have the Northern Lights, but I'm not sure it was a fair swap. My main activities in Scotland were meteors, aurora and noctilucent clouds - phenomena well seen from Scottish latitudes. Here, the best meteor showers occur in the wee small hours, and tend to be fairly poorly seen, with radiants down low; as for aurora and NLC, there is very little chance of seeing them from 27° south. It has to be said, therefore, that without three of the main attractions for me, I haven't done as much astronomy in the past 13 years might have been expected. Still, having gained employment at the Sir Thomas Brisbane Planetarium, I feel I have redeemed myself somewhat. Below is a brief intoduction to my current activities. Much of October was consumed with concerns about moving house, and the aftermath thereof. I did want to try and catch my 2 asteroids, but with one of them not being around until the early hours, I just didn't have the energy after moving packing boxes around, attending to the garden, and all the other tasks associated with a relocation. However, I fear that I might have missed my chance with that one: not only was (3753) Cruithne at its brightest during the move, but it is now drawing closer to the Sun, and I'm unlikely to be able to shoot it in a dark sky; an hour before sunrise might be the best I can manage. Still, nothing ventured. (5577) Priestley is better placed as an evening object not far from opposition, and currently within about 10 degrees of the zenith in mid-evening, but it's in a sparse field, and won't be easy to find from light-polluted Brisbane. Each of them is around mag. 17, so it won't be an easy task getting a decent smudge on the sensor, but it's certainly worth a go. Then there's asteroid Brisbane. Photographing this will be my official duty, albeit a light-hearted one, but being also around mag. 17, it will present as much of a challenge as with the other two. Speaking of challenges, I was in the dome after our final Saturday night show, trying to see whether mag. 17 might be at all possible, simply in terms of a long, accurately-driven exposure. I'm sure I'll need something around 5 minutes, and it's not yet clear that the Zeiss drive is up to the task; what I've attempted so far seems to show that the drive quality can be variable. As it turned out, the results were inconclusive, because of both the bright Moon and the drive quality, so the jury is still out. However, the seeing was pretty good, with much more detail visible on Jupiter than I've ever seen before. Having unleashed a few exposures of the Big Fella and the waning Moon (just a day and a half past Full), I thought I'd point at Uranus and see what happened. No hope of seeing anything on the planet itself, of course, but I wondered whether any of its moons might show up. The answer can be found here. I don't normally look at the Moon that close to Full, but as the seeing was so good, I couldn't resist the temptation. I've also been trying out a Tamron 2x teleconverter that's been in my kit, largely unused, for years. There is a degree of lateral colour creeping in, but as I generally just use the green channel for the lowest noise result, that's of little importance. What it gives me is a 4500 mm f/30 system, for a closer view of the Moon. As well as the Moon, Jupiter's disk is large enough at around 50 arcseconds that 4500 mm gives a usable image. I'd rather be shooting it through a 14-inch at f/30, but that isn't an option just now. Still, in moments of good seeing the Zeiss is doing a reasonable job. 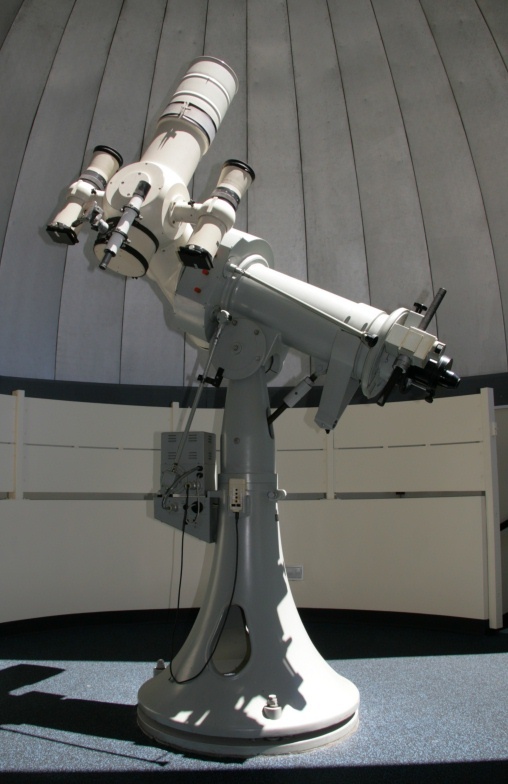 One thing that I miss from Edinburgh is the 6-inch Thomas Cooke photovisual refractor at the City Observatory. As a long time member of the Astronomical Society of Edinburgh, I had access to that fine instrument, though foolishly, I did not make as much use of it as I should have done. Now that I am substantially removed from it, I feel the distance. The planetarium does have a Zeiss 6-inch refractor, but it is not a photovisual objective, and therefore not so good for photography. It is, however, on a coudé mount, so it is a relatively trivial matter to attach a camera, no matter how heavy, to shoot at prime focus. This I have started doing, after just using a point & shoot digicam through the eyepiece. The acquisition of a DSLR camera means that I am able to make much more of the 'scope's abilities. Before I obtained an adaptor to mount the camera properly, I made some initial exposures with the camera body aligned carefully with the rear end of the scope (all 2250 mm focal length, f/15). Click each image for a larger version. Omega Centauri, a globular cluster around 16,000 light years away. Single 30-second exposure, ISO 1600. Kappa Crucis (the Jewel Box), an open cluster beside the Southern Cross. Combination of 3 30-second exposures, at ISO 1000 & 1600. Comet Garradd passing through Sagitta, near the Coathanger asterism in Vulpecula; combination of 6 images, 5 x 30 seconds at ISO 1600, plus one 30 seconds at ISO 3200. For southern hemisphere observers, this comet is seen low in the north and is unfortunately heading northwards, so we will pretty much lose it after October 2011. Closest approach to Earth is in March 2012, when it will be in Ursa Minor. At the time of these exposures, the comet was around mag. 7-8. Magnitude 14 with 30-sec exposures! This shows the image compared with the same field from Stellarium. Based on this, stars fainter than mag. 14 have been recorded. At the first chance I get, I'll attempt an exposure of Pluto. Just past first quarter, with sunrise starting to illuminate Mare Imbrium; Ptolemaeus, Alphonsus and Arzachel are still in shadow, but their form is just visible, with sunlit just touching the north-western rim of Ptolemaeus. The seeing at the planetarium isn't excellent, but this image was taken in one of the better moments. I have used just the green channel, to avoid the chromatic fringing. Detail of image at left, featuring Hyginus, Ariadaeus and Triesnecker craters and their associated rilles. Being a Scottish astronomer, I was familiar with this object. A gorgeous little glowing ring, easy to find and visible in fairly small instruments. I had taken 2 trial exposures of it last week, but added 5 more last night. The central star appears to be visible. I was trying to see how faint I could go, as a precursor to shooting Pluto (I couldn't properly identify the field for Pluto, so went for this instead). First attempts indicated that stars fainter than 14 were possible, but I wanted to see how much fainter. Based on this set of exposures (7 images stacked, with exposures of 20-30 sec, and ISO values from 1000-1600), I can likely reach 15. These images were taken by just placing the camera on a static tripod, at the coudé focus. The centre of the image therefore remains static, but there is gradual field rotation over the course of a series of exposures, which has to be corrected when stacking the separate images. With a proper adapter to attach the camera there will be no such problem, and it will be easier to acquire correct focus. This image shows a central square (the first 2 images), blended with the 5 from last night. Magnitudes taken from Stellarium are appended to selected stars (it is possible that I have recorded stars as faint as mag 15.2). I have processed for faint star detection, rather than colour fidelity in M57, but it looks reasonably like the object we know and love. Here's a shot of the Zeiss during the day. I had just finished shooting the Sun, so thought I might as well record the beast itself. the eyepiece end uses interchangeable flanges for an eyepiece turret, binocular eyepieces and other accessories; in this image the 42 mm-threaded attachment for mounting a camera is in place.